Today, the Constitution Commemorative Silver Dollar Coin remembers when the delegates chosen by the state of New Jersey unanimously agreed to the governance of the new federal rules. In Convention of the State of New Jersey. “Resolved, unanimously, That the persons so elected to serve in state Convention, do assemble and meet together on the second Tuesday in December next, at Trenton, in the county of Hunterdon, then and there to take into consideration the aforesaid Constitution and if approved of by them, finally to ratify the same, in behalf and on the part of this state, and make report thereof to the United States in Congress assembled, in conformity with the resolutions thereto annexed. Now be it known, that we, the delegates of the state of New Jersey, chosen by the people, thereof, for the purpose aforesaid, having maturely considered the aforesaid proposed Constitution, do hereby, for and on the behalf of the people of the said state of New Jersey, agree to, ratify, and confirm, the same and every part thereof. Done in Convention, by the unanimous consent of the members present, this 18th day of December, in the year of our Lord 1787, and of the independence of the United States of America the twelfth. John Stevens, President, and delegate from the county of Hunterdon. County of Cape May: Jesse Hand, Jeremiah Eldridge, Matthew Willdin. Hunterdon: David Brearly, Joshua Corshon. Morris: William Windes, William Woodhull, John Jacob Faesch. Cumberland: David Potter, Jonathan Bowen, Eli Elmer. Sussex: Robert Ogden, Thomas Anderson, Robert Hoops. Bergen: John Fell, Peter Zobriskie, Cornelius Hennion. Essex: John Chetwood, Samuel Hay, David Crane. Middlesex: John Neilson, John Beatty, Benjamin Manning. Monmouth: Elisha Lawrence, Samuel Breese, William Crawford. Somerset: John Witherspoon, Jacob R. Hardenberg, Frederick Frelinghuysen. Burlington: Thomas Reynolds, Geo. Anderson, Joshua M. Wallace. Gloucester: Richard Howell, Andrew Hunter, Benjamin Whitall. Salem: Whitten Cripps, Edmund Wetherby. Attest. Samuel W. Stockton, Secretary. 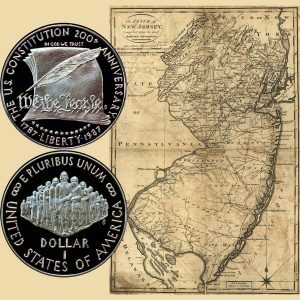 The Constitution Commemorative Silver Dollar Coin shows with a map of New Jersey, circa 1795.